This article originally appeared in the Tuscaloosa News on September 7, 2006. Adrienne Fisher was born with racquetball in her blood. It goes to the very core of this 21-year-old. She began playing racquetball when she was 7 years old. Her parents met on a racquetball court, and her father even owned a racquetball club for several years in her hometown of Centerville, Ohio. For Fisher, racquetball it’s more than a sport. It has become life- consuming, and, at times, life-dictating. Racquetball also is the reason Fisher is in Tuscaloosa. 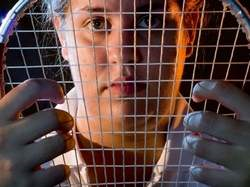 As she was preparing to graduate from high school, a racquetball team was being put together as a club sport at the University of Alabama. Planning to join the team were several of her friends who also played on the national racquetball circuit. Her goal is to become the nation’s fifth-ranked player. Currently No. 13 in the Woman’s Professional Racquetball Organization, Fisher has been ranked as high as 10th. She said she’s in a bit of a rut. Adjusting to new coaching, team play and academic demands have made this a harder transition than she anticipated. She later admits she’s her toughest critic. She is, after all, among the elite racquetball players in the world. “It’s been bad before that I don’t give myself credit for the good things I’ve accomplished,” she says. Fisher holds several titles, having won every girls division for every age she’s played in. She has corporate sponsorship from Head and Gamma Strings. While she has been playing in the professional circuit since January 2001 – when she was a sophomore in high school – she can’t make a living by playing the sport. “There is no money. 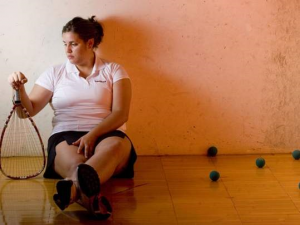 You play racquetball because you love it and there is no other reason to play,” she said. She hasn’t been clocked since. Ask her to analyze her game and it becomes apparent how methodical she is when it comes to the sport. In other words, she keeps her opponent guessing by accurately slamming the ball against the wall without letting on where she’s aiming. As she enters her final year at UA, she said she will be concentrating on completing her undergraduate work — she’s majoring in marketing – and reaching her goal of becoming on the top five female racquetball players. Even then, she said, she often will have to pause and describe the sport she loves. Personal: Single. Parents are Rex and Elaine Fisher.